Advantage Camouflage president Bill Jordan introduces his newest, most effective camouflage ever, Advantage Timber. 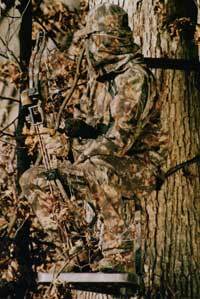 New Advantage Timber is the first camouflage of its kind. Years of research were required to perfect the technology needed to create this uniquely advanced yet natural pattern. The Techno-Realism process developed by Advantage Camouflage gives new Advantage Timber properties no other camo pattern can duplicate. To put it simply, new Advantage Timber works. The pattern provides lifelike color reproduction, unmatched definition, exceptional contrast, improved three-dimensional effects, and non-directional elements for improved camouflage effect and universal placement on products (no matter how you turn it, the pattern works). All of this combines to create a uniquely realistic and effective camouflage pattern. Step into new Advantage Timber; you'll feel like you're stepping outdoors.